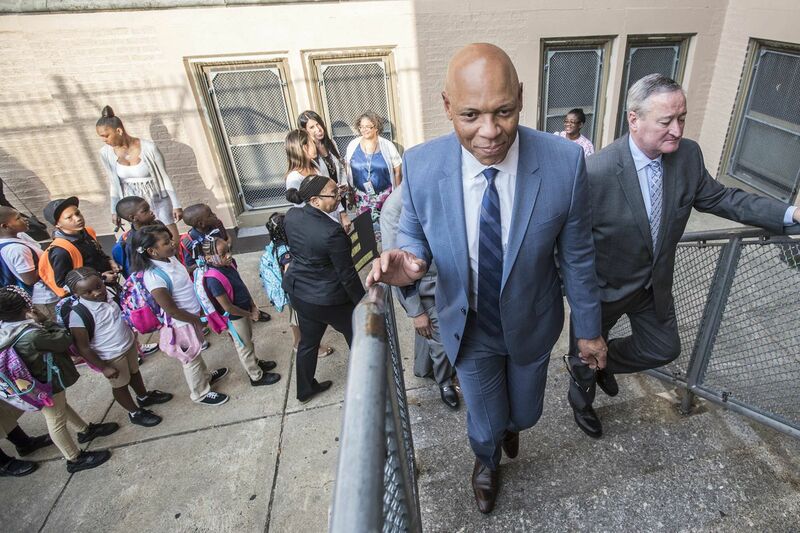 Philadelphia School Superintendent William Hite and Philadelphia Mayor Jim Kenney, right, climb the stairs into Pennell Elementary. Hite released his Action Plan 3.0 update Tuesday, claiming slow, steady progress. How many Philadelphia 8-year-olds read at grade level? How many city students graduate from high school prepared for college and careers? Are the district’s finances in good shape? Are all school jobs filled with talented employees? Philadelphia School Superintendent William R. Hite Jr. measures the accomplishments of his administration by these yardsticks, the four “anchor goals” of his Action Plan 3.0. In an update released Tuesday, he highlighted the slow, steady progress the district has made since he arrived in 2012. Which are Philly’s best, most promising schools of the year? School District touts 42. What if you can’t raise $90K for a library? In Philly schools, there are haves and have-nots. “The progress that we are seeing in schools across the city is not a coincidence; it’s because of intentional planning around how we can best support our diverse school communities,” Hite said. 100 percent of students will graduate, ready for college and career. Score: 69 percent. (This measures the district’s four-year graduation rate. Whether those graduates are ready for college and career is a more subjective measure, difficult to quantify.) This is up 4 percentage points since Hite became superintendent in 2012. 100 percent of 8-year-olds will read on or above grade level. Score: 36 percent. This is down nine points since Hite took over, but up three points since 2014-15, when the test changed considerably based on Pennsylvania Common Core Standards. Statewide, 64 percent of Pennsylvania third-graders read at or above grade level. Hite first introduced his plan in 2013, and has issued annual updates since then. The most recent update comes on the heels of the district’s releasing progress reports for each of its 220 schools, plus most city charter schools. There are about 130,000 students enrolled in district schools. Seven out of 10 district schools have improved since the district first began issuing progress reports in 2014-15. The number of low-performing schools has dropped 50 percent, from 84 to 41, and the number of high-performing schools has more than doubled, from five to 12. Each school is given a score based on academic achievement and progress, climate and safety, and college and career readiness. Based on the score, schools are placed into four categories. The School District of Philadelphia scored its progress toward reaching 100 percent completion on four core goals. Goal: 100 percent of students will graduate ready for college or career. Figure reflects the district’s four-year graduation rate. 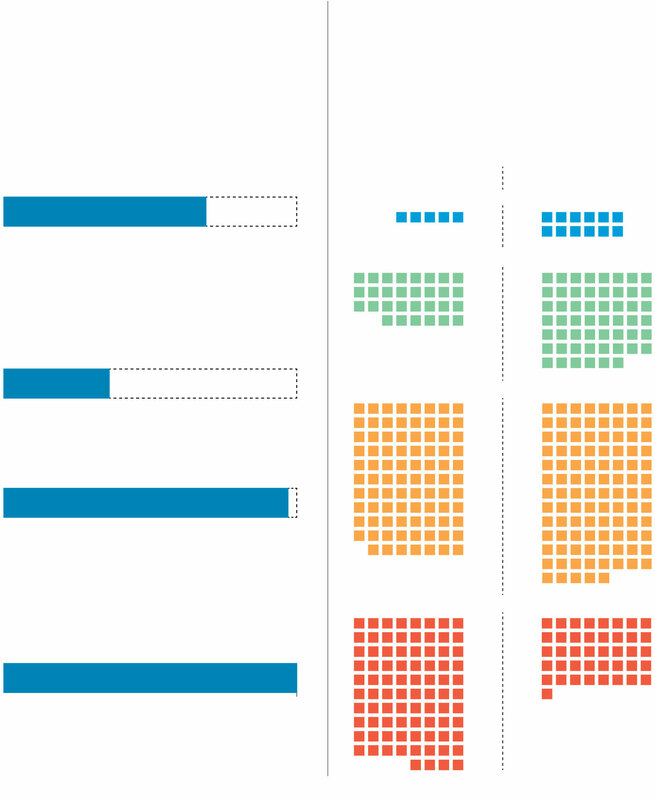 Measuring whether students are ready for college and career is more difficult to measure. Goal: 100 percent of 8-year-olds will read at or above grade level. Goal: 100 percent of positions filled by great principals, teachers, and employees. Figure reflects the district’s position fill rate. Measuring whether employees are great is subjective. Goal: 100 percent of funding for great schools is secured with zero deficit. It is accurate to say the district has had a balanced budget for five years straight. Whether the district secured adequate funding for “great” schools is debatable. The results drew plaudits from Mayor Jim Kenney. Joyce Wilkerson, school board chair, said that the district could make more progress faster with more resources, but that generally, the news was good. “A whole school district migrating towards improvement is something I’m delighted with,” Wilkerson said.